I promised to write only of happy things, but I can’t pass up this chance to write something I love talking about, my causes and advocacies. 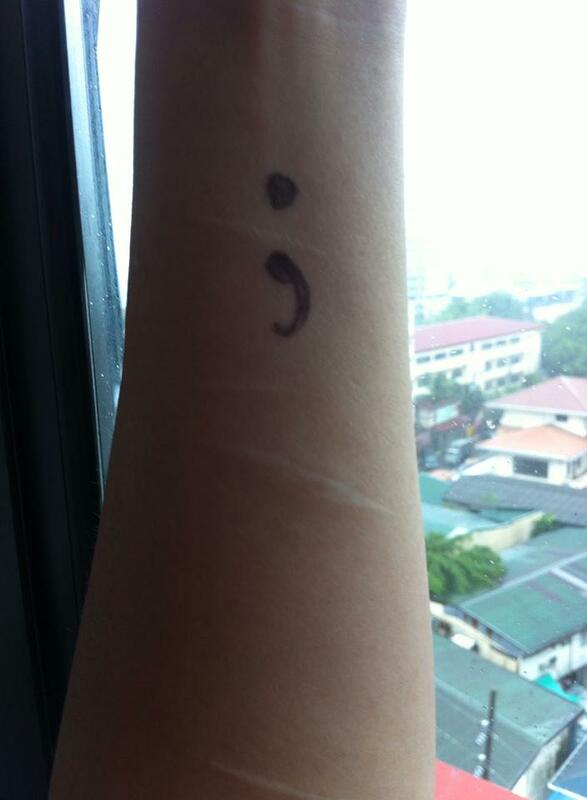 Recently, I stumbled upon an article in Cosmopolitan Philippines , Here’s Why Semicolon Tattoos Are a Thing, and it was about the reason why people were posting photos of semicolon tattoos on social media sites. For some reason, I was absent from Instagram for quite a number of days, almost a week and wasn’t aware of this. But reading through the article, I learned that it was posted by people who wanted to make a stand against discrimination , spread awareness on Mental Health and the stigma that comes with it. I have very been vocal about my battle with the disease, yes, it is a medical condition and not just a social disease, although sometimes people associate it more with the latter. I have written a lot about my experiences to raise awareness and somehow to be able to help others speak out and seek for help. 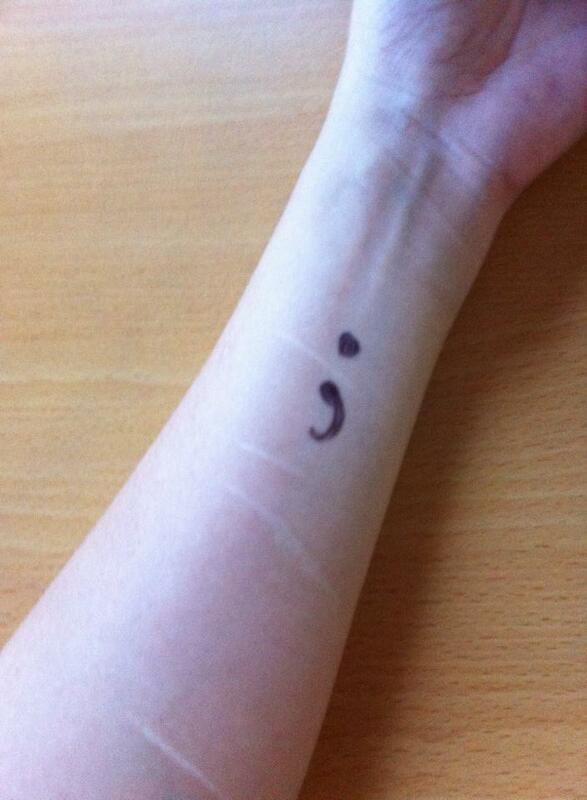 The movement was initiated by The Semicolon Project, a faith-based organization whose main objective is to raise awareness of depression and the other things that comes with it like self-harm, addiction and suicide , encouraging people to draw semicolon on their wrists to show support , encourage and most of all love. I honor movements or organizations like this because this is a lifeline to victims of depression and other mental health problems. Depression is no laughing matter and the more people ignore the manifestations of being depressed , the more it becomes dangerous to the person experiencing it. Someone told me that it is just a state of mind and can be “cured” by changing one’s perspective. I dared to disagree because I know for a fact that there is something deeper than that. It just showed me that many, including people who loved me, did not really understand what I was trying to convey to them during my depressed period. Nobody would really understand depression unless they have been depressed themselves. I am not a psychiatrist , nor do I present myself as an expert on mental health, but in my humble opinion, the years that I’ve suffered (and until now, I still have such bouts, although controllable), is enough for me to say that I know how it really feels like to be on that end. Self-harming, cutting and overdosing on pills was the pinnacle of my depressive state. It was the darkest moments in my life. I can say that I would not truly have healed myself had I not held on to my faith. Of course, the road to recovery or complete healing cannot be achieved by one type of “treatment” only. It should be a combination or equal parts of faith-based activities (prayer, spiritual awareness), the right medication with medical supervision, counseling and empowerment, physical activities such as exercise and most of all establishing a reason for living which is summed up in one word, “self-worth”. “Stigma is the number one reason why people choose to keep the state of their or a loved-one’s mental health a secret. In the Philippines where mental illness is considered either a curse or “bad luck”, people with mental health problems are most of the time kept inside the homes if the family cannot afford treatment. Read more of that paper here. I am healed through my own efforts, of having the desire to be well. My life was placed in a situation where my mental health was challenged by some people to prove my capacity to raise my kids. Maybe that was the turning point where I had the reason for my existence. I found my self-worth by going through that ordeal. And most of all I had my renewed faith in God. There is a long way to go for people with depression. Acceptance and erasing the stigma is still a far sight. But the most important thing is that people are helping people, educating , empowering, accepting and loving one another with one noble motive, to raise awareness and helping one another overcome this. Bottomline, all is not lost. There is hope. Seek help.